tho the question now rather seems to be wheather this is a bug only i'm experiencing? 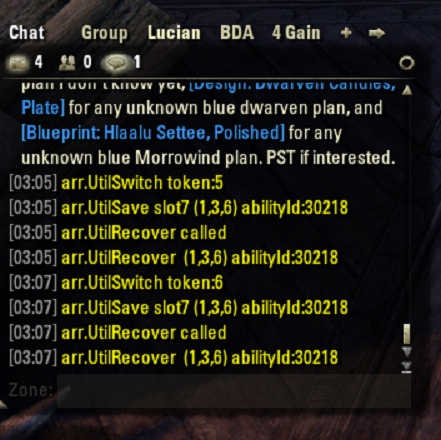 when i slot ARR to a different slot, the first time i set it like this, i quit the game completly as to *save* it. I noticed that if i do not do this at list the first time, the skill is removed as soon as the ARR is slotted automatically by the addon at the 5 place. Which is logic as you can not have 2 skills identical on the same bar. In some situations, I put Rapid Maneuver on the Ability Bar (replacing an another ability that has been put in the same slot) when my character will be running and sprinting on foot. The problem is, if my character summons a mount, the mount appears and the character mounts, and the Rapid Maneuver ability is deleted from the Ability Bar. The slot is empty. Dismounting does not restore Rapid Maneuver to the slot. UPDATE: What I described only happens if I put Rapid Maneuver into a different "slot" on the Ability Bar than is set in the Assisted Rapid Riding Configuration UI. For example, if I slot RM in #4 while ARR is configured for #5, then Rapid Maneuver disappears from slot #4 when my character mounts, and the ability in #5 is unaffected. If I slot Rapid Maneuver into the ARR configured slot, nothing changes when my character mounts and RM remains slotted after the character dismounts. When I first looked at the RR Configuration UI, I did not recognize the feature to assign the slot to be used because it is a slider, not a set of radio buttons or something else that seems to be beyond the ESO add-on API. Thanks for creating this add-on, and for your time and attention to my report. Last edited by Shadowshire : 06/24/17 at 05:30 PM. my question has nothing to do with the skill or the ability bar. i want to know why when i use the ability Rapid Maneuver (which ougth to apply the buffs Major Expedition and Major Gallop on use), when it gets slotted by this addon, only the buff Major Gallop applies and not the buff Major Expedition as well? I believe it's still because of what I said. Place Rapid Riding on your bar, apply it, and remove it. You'll keep Major Expedition but not Major Gallop. This mod removes the skill from your bar after using the skill (assuming you use it while mounted). Try using the skill on foot and see if it applies both buffs. I'm not the mod author, but I can guess what's happening. If you use this mod to apply rapid riding while mounted, it automatically toggles off your bar. The effect will stay on while mounted, but if you dismount, you'll lose the effect. Now if you activate it while dismounted, the skill stays on your bar, even if you mount. A user requested an option to always keep the skill on your bar (preventing this from happening), and I made a quick edit to cloudor's mod and integrated that request as I wanted it too. You can find it in a post or two below. Last edited by Jerkling : 06/23/17 at 09:07 AM. Hey, I really love this addon, can I make two (hopefully) small requests? 1. Add an option to replace a skill on a specific bar only. 2. Add an option to not automatically unslot the skill after using it while you are still on a mount. The second request is something I wanted too. I made a quick edit to cloudor's file. You can download the updated version here. You're able to toggle the option on or off through the addon menu. Cloudor, if you want, you can integrate it into the main release. It was only a few lines of code, so no credit needed. Last edited by Sir_Thatchor : 06/20/17 at 08:04 PM. Use other slot if you want to use the skill on foot? one question tho - why does when i activate Rapid Maneuver (or its morphs for that matter) only the mounted movement speed buff apply and not the normal movement speed buff as well? Rapid Maneuver does buff the speed of the mount while your character is mounted. That is, the mount moves MUCH faster after you use RM than it does before you use RM. The mount gallops even faster while I use Sprint after casting RM. Casting RM uses Stamina from my character, but the mount does not consume any Stamina while buffed by RM. Of course, if I use Sprint, then the Stamina of the mount begins to decrease, but a mount can gallop a long distance before running out of Stamina. The same thing happens while my character is on foot. If I cast RM, my character runs faster at a steady pace, and if I use Sprint after using RM, then my character can really move fast! The key thing to remember, though, is that Sprints requires the character or mount to consume Stamina. Casting RM uses Stamina, but a character doesn't consume additional Stamina while running after casting RM. Last edited by Jerkling : 06/17/17 at 07:47 AM. Please switch on this addon debug option and send me the log(copy in message box) if error again, thank you.